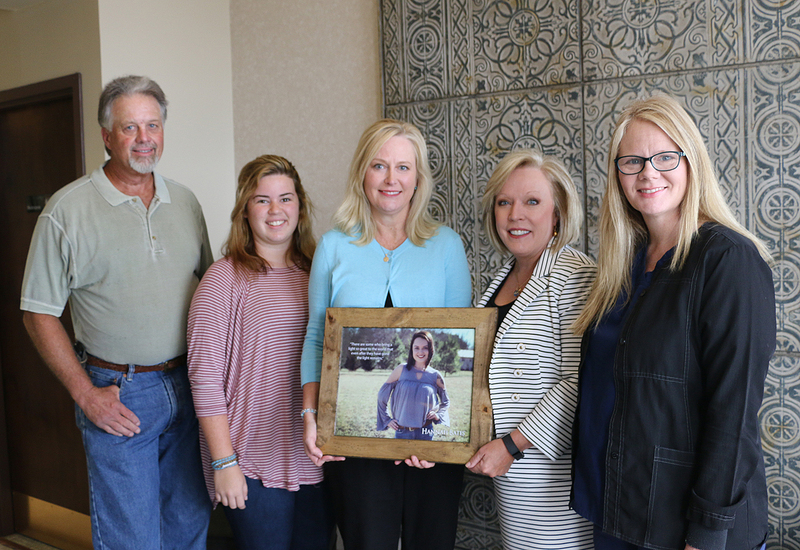 Family and friends of Hannah Bates have established a scholarship fund in her memory through the Wallace State Future Foundation. On hand for a presentation are from left: her father, Lionel Bates; friend, Jayclyn Nail; mother, Sonya McSwain Bates; Wallace State President Dr. Vicki Karolewics; and her aunt, Penny Aldredge. HANCEVILLE – "Live fearless" was one of Hannah Bates’s life mottos and she did just that every day of her 21 short years on Earth. To honor her memory, her zest for life and her giving spirit, her family and friends are giving back with the establishment of the Hannah Bates Memorial Scholarship fund through the Wallace State Community College Future Foundation. Fishing and horse riding both are among the first fundraisers they plan to host to raise money for the scholarship fund. The 2018 Hannah Bates Memorial Bass Fishing Tournament is planned for Saturday, Aug. 4 at Smith Lake Park. Registration will start at 5 a.m., launch at 5:30 a.m., and weigh-in at noon. Registration is $75 per boat, with a maximum of two team members per boat. Prizes include $500 for first place, $100 for second place and $50 for third place. Participants can register at www.wsccalumni.org/hannahbatesfish2018 or call 256-339-4950 or 256-595-5507. A trail ride is in the works for the fall, with the date and location to be determined. At the time of her death, Hannah was one semester away from finishing her associate degree in Business Management. Wallace State presented her family with Hannah’s diploma. She had previously earned her associate in science degree through Wallace State’s Fast Track program and had started the Nursing program. “She always wanted to be a nurse since she was a child,” Sonya Bates said. “She volunteered at the hospital every summer.” After one semester in the program, she decided that nursing wasn’t for her and switched to the Business Management program. For those reasons, a Hannah Bates Memorial Scholarship will be offered each year to students in the Fast Track, Business Management or Nursing program at Wallace State. The recipient will be based on financial need and an essay about how they’ve overcome adversity and obstacles in their life. The first $500 scholarship will be awarded for the upcoming Fall 2018 semester. For information about the scholarship or to make donations to the fund, visit www.wsccalumni.org/hannahbates or call 256-352-8144. Donations to the Hannah Bates Memorial Scholarship may also be mailed the Future Foundation at PO Box 568, Hanceville, AL 35077.